JAMES RIVER, NS – John Flemming had a mechanical issue on the pace lap for the Lucas Oil 150 that looked like potential disaster for the series point leader – but a cool head and a calm crew saw Flemming rebound from a start nearly 1/2-lap behind the field to win the second last race on the 2014 Parts for Trucks Pro Stock Tour. 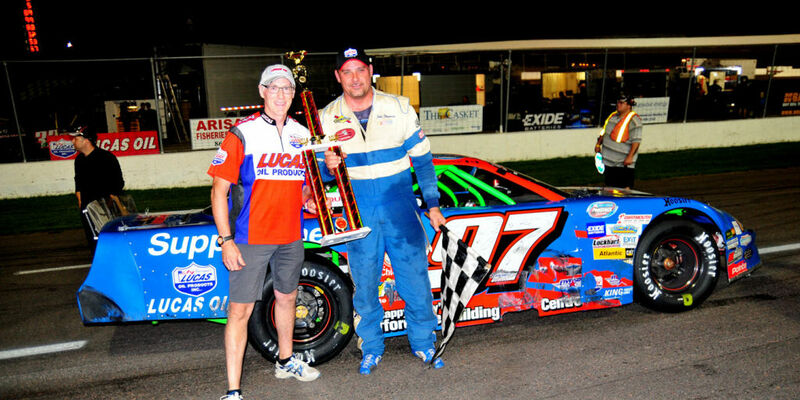 The event was held Saturday evening at Riverside International Speedway. Flemming took the point on lap 115 and held on in spite of a late surge by Shawn Turple, who finished second, followed by Jonathan Hicken. Donald Chisholm and Craig Slaunwhite rounded out the top five. For much of the race it looked like series sophomore Cole Butcher had the race win locked up – a long green flag run of 102 laps saw Butcher stretch his lead to a 1/2 lap by times – but on lap 106 disaster struck for the teenager when he was racing to lap fellow series sophomore Dylan Blenkhorn, and spun, having to restart at the back of the field, and finishing eighth. The race saw a fast pace with just two cautions and a run-time of under one hour. Flemming set fast time in time trials. Hicken’s win in the dash gave him the pole position for the feature. Craig Slaunwhite and George Koszkulics won the heat races. 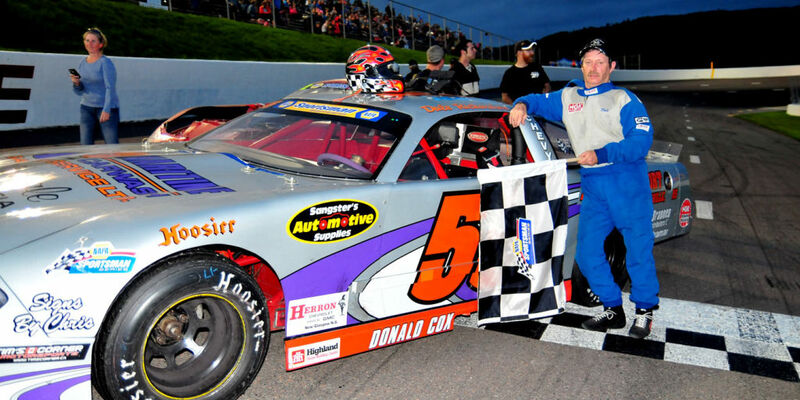 The win all but clinches a fifth series title for Flemming who will take a 44-point lead to Scotia Speedworld next weekend for the championship race; with a maximum gain of 60 points per event second-place Hicken would have to lead the most laps, without Flemming leading any, and finish 17 spots ahead of Flemming in order to overtake the lead. If Flemming clinches the title he will become only the third Maritime racer to ever earn five titles, joining Greg Sewart and Wayne Smith in that category. With Sewart retired and Smith semi-retired, Flemming would have a realistic chance to equal or exceed Smith’s regional high title total of six. The series season 200-lap finale goes next Saturday at Scotia Speedworld; start time is 4 p.m.
Dale Richardson led 63 of the 75 laps that comprised the feature race for the Napa Sportsman Series, stretching his lead to more than a 1/2-lap by times and only curtailed by cautions. Corey Breen finished second and Jerry Hayes finished third. Darren Price and Dave Timmons rounded out the top five finishers. Shawn Waterfield was the only other lap leader. The race saw six cautions and took 47 minutes to complete. Colby Smith (subbing for Chris Reid) and Waterfield won the sportsman heat races. The Napa Sportsman Series moves to Cape Breton Miners Memorial Speedway to for two more events this year to finish the 2014 season. 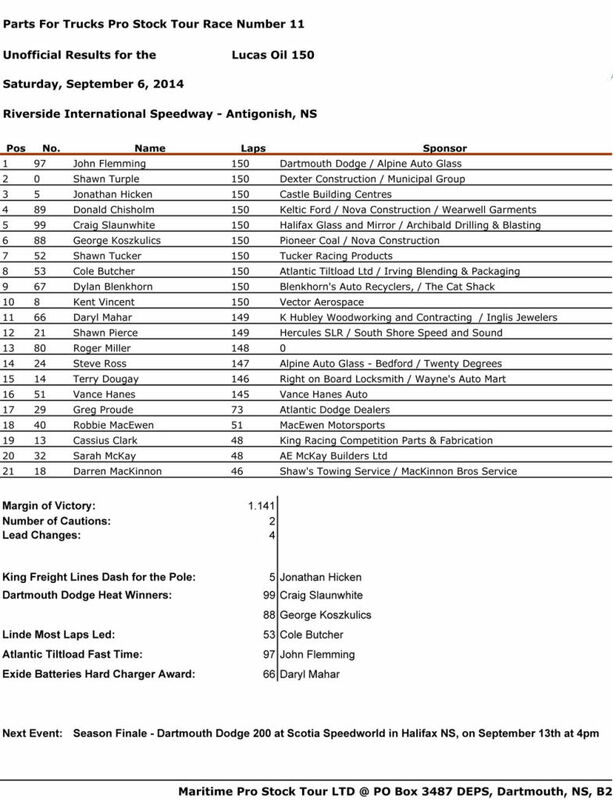 The Lucas Oil 150 event concludes the 2014 race season at Riverside International Speedway. Stay up with our latest news by subscribing to our newsletter.